Online racebooks are one of the greatest inventions since the French came up with the idea of pari-mutuel betting. 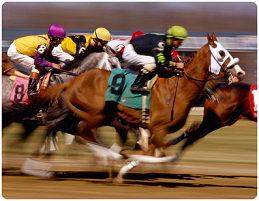 No more traveling to the nearest horse racing or dog racing track to place your bets. No more calling a bookie that charges an arm and a leg in commission. Simply visit an online racebook and every race you could possibly want to bet on awaits you – it’s really that simple. Online racebooks are very similar to online sportsbooks except that an online sportsbook caters to all varieties of sports betting opportunities. Many of them include online racebooks, with bets on the ponies made available right alongside the other sporting events. An online racebook, on the other hand, focuses only on racing. Online racebooks are generally focused on horse racing betting. Most will also follow the greyhound racing circuit as well, but the ponies are what most online racebook fans show up for. There are tons of sites that offer horse betting, but some are even sanctioned and LEGALIZED by the USA government – one such book is Twinspires. Click on the banner below to find out more and how to deposit using ANY major credit card. One of the best benefits of placing your wagers through an online racebook is the overall versatility. Sure, you could visit the local track and probably place wagers on all horse races occurring that day in associated race parks, but what about all of the other horse races taking place in the world? Maybe you want to wager on a horse race in Kentucky, but there’s another race starting 12 hours later in Melbourne, Sydney, Australia that’s caught your eye? Online racebooks follow all of the big horse races from the United States to Canada, England to Ireland, France to Germany, Queensland to Victoria. You’ll never miss out on another horse race betting opportunity with online racebooks. Not every online racebook is going to have so much coverage of every horse race around the globe. For example, Sportsbook.com generally covers all A-D class thoroughbred and harness track horse races in North America (USA and Canada). International online racebooks will focus more on all of the major events. Another major benefit of online racebooks is the free betting opportunities. How many bookies can you call up and ask for a free wad of cash to place your bets with? None? Didn’t think so. Try an online racebook and you could be placing your first bets with real money, without actually spending a penny of your own cash. Online racebooks might offer a “free bet” to all new members, where the bettor is given a certain amount of cash to place whatever bets they like, or a free match bet where there first wager is met up to $25 or so (i.e. you bet $25, the online racebook matches it for a $50 bet). Or you may simply be awarded a match bonus on your first deposit; you deposit $100, you get another $100 to bet with. The online racebook industry is very competitive, so inducing your business is a big part of their marketing campaign. The punters have nothing to lose and everything to gain from these valuable promotions, so why not place your bets at an online bookie, where the benefits greatly outweigh that of live horse race track betting.